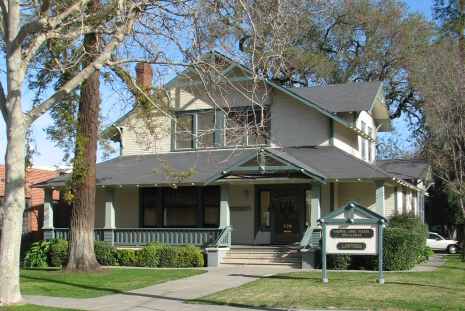 The Alge House, located at 429 First Street, Woodland, is among the many distinguished historical homes of Yolo County. It has a rich history, as unique and varied as that of the City and County which it calls home. Constructed in 1910, the Alge house was originally the residence of Richard Alge, an Austrian immigrant who made his way to Woodland from New York in 1878. Alge and his wife, Louisa Graff Alge, commissioned a prominent local architecture and construction firm, the Keehn Brothers, for the project. The Keehn Brothers were responsible for many of Woodland's architectural wonders, most notably the Gibson Mansion. The Alge house is an exemplary model of the Craftsman style homes which were popular at the time. Richard Alge himself was a founding member of the Holy Rosary Catholic Church, and a prominent Woodland businessman for many years. He was a noted butcher, running a shop on Main Street with his partner, George Armstrong, for over thirty years. He also served in the Woodland Volunteer Fire Department. Deborah B. West, the great-great grandaughter of Louisa Alge, tells us that Mrs. Alge lived in the house until March 21, 1969, when she passed away at the ripe old age of 102. The Alge House retained its residential purpose until the year 1975, which brought a new mission for the building. That year, a joint project between the Yolo County Probation and Social Service agencies converted the home to what became known as the Midtown School. For the next seven years, it provided a foundation for the future of many young Woodlanders. In 1985, a joint project between several local businessmen remodeled and converted the Alge house into office space. Much of the original woodwork was spared in the remodel and can still be seen today. After a brief stint housing a farm credit agency, the Alge house became the base of Rodegerdts, Means, Janes and Estey, one of Woodland's oldest law firms. The firm evolved, and in 1994, Rodegerdts, Means, Janes, Nakken and Hugo merged with Chalmers, Sans, Gardner and Nolan, Woodland's oldest law firm, to become Gardner, Janes, Nakken, Hugo and Nolan.